This topic walks you through recommended configuration for tenant-wide settings that affect the security of your Office 365 environment. Your security needs might require more or less security. Use these recommendations as a starting point. Office 365 Secure Score analyzes your Office 365 organization's security based on your regular activities and security settings and assigns a score. Begin by taking note of your current score. Adjusting some tenant-wide settings will increase your score. The goal is not to achieve the max score, but to be aware of opportunities to protect your environment that do not negatively affect productivity for your users. See Introducing the Office 365 Secure Score. The Microsoft 365 security center includes capabilities that protect your environment. It also includes reports and dashboards you can use to monitor and take action. Some areas come with default policy configurations. Some areas do not include default policies or rules. Visit these policies under threat management to tune threat management settings for a more secure environment. If you have a custom domain, create an anti-phishing policy to protect the email accounts of your most valuable users, such as your CEO, and to protect your domain. Review Set up an anti-phishing policy and create a policy using the example as a guide: "Example: Anti-phishing policy to protect a user and a domain." You can also create custom malware filter policies and apply them to specified users, groups, or domains in your organization. • Use safe links in: Office 365 ProPlus, Office for iOS and Android (select this option). • URLs will be rewritten and checked against a list of known malicious links when user clicks on the link (select this option). • Use Safe Attachments to scan downloadable content (check this box). • Applied To — The recipient domain is (select your domain). More information: Office 365 ATP safe links. • Too much spam — Choose the Custom settings and edit the Default spam filter policy. • Spoof intelligence — Review senders that are spoofing your domain. Block or allow these senders. More information: Office 365 Email Anti-Spam Protection. • Sender Policy Framework (or SPF). - For setup, see Set up SPF in Office 365 to help prevent spoofing. • DomainKeys Identified Mail (DKIM). - See Use DKIM for email in your custom domain in Office 365. - After you've configured DKIM, enable it in the security center. • Domain-based Message Authentication, Reporting, and Conformance (DMARC). - For DMARC setup Use DMARC to validate email in Office 365. For non-standard deployments of SPF, hybrid deployments, and troubleshooting: How Office 365 uses Sender Policy Framework (SPF) to prevent spoofing. Visit these reports and dashboards to learn more about the health of your environment. The data in these reports will become richer as your organization uses Office 365 services. For now, be familiar with what you can monitor and take action on. 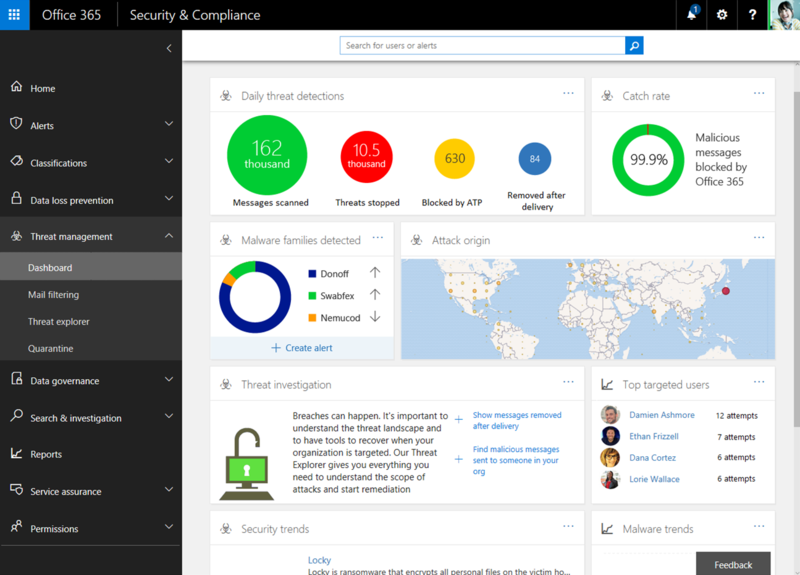 For more information, see : Reports in the Microsoft 365 security and compliance centers. In the Threat management section of the security center, use this dashboard to see threats that have already been handled, and as a handy tool for reporting out to business decision makers on what threat investigation and response capabilities have already done to secure your business. This is also in the Threat management section of the security center. 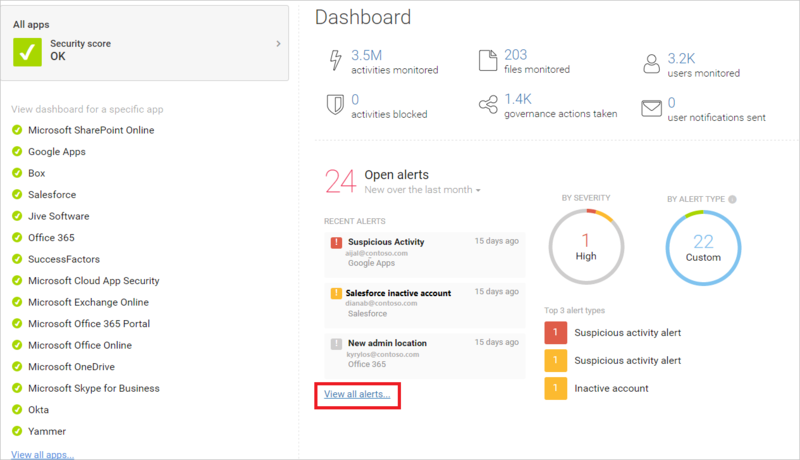 If you are investigating or experiencing an attack against your Office 365 tenant, use the threat explorer to analyze threats. Threat explorer shows you the volume of attacks over time, and you can analyze this data by threat families, attacker infrastructure, and more. You can also mark any suspicious email for the Incidents list. In the Reports section of security center, view audit reports for your SharePoint Online and Exchange Online organizations. You can also access Azure Active Directory (Azure AD) user sign-in reports, user activity reports, and the Azure AD audit log from the View reports page. Many of the controls for security and protection in the Exchange admin center are also included in the security center. You do not need to configure these in both places. Here are a couple of additional settings that are recommended. Mail Flow (mail flow rules, also known as transport rules) No Add a mail flow rule to help protect against ransomware. See "How to use Exchange Transport Rules to track or block emails with file extensions used by ransomware" in this blog article: How to deal with ransomware. Create a mail flow rule to prevent auto-forwarding of email to external domains. For more information, see Mitigating Client External Forwarding Rules with Secure Score. Enable modern authentication No Modern authentication in Office 365 is a prerequisite for using multi-factor authentication (MFA). MFA is recommended for securing access to cloud resources, including email. Modern authentication is enabled by default for Office 2016 clients, SharePoint Online, and OneDrive for Business. SharePoint team sites configured at the baseline level allow sharing files with external users by using anonymous access links. This approach is recommended instead of sending files in email. To support the goals for baseline protection, configure tenant-wide sharing policies as recommended here. Sharing settings for individual sites can be more restrictive than this tenant-wide policy, but not more permissive. • Allow sharing to authenticated external users and using anonymous access links (default setting). • Anonymous access links expire in this many days. Enter a number, if desired, such as 30 days. • Default link type — select Internal (people in the organization only). Users who wish to share using anonymous links must choose this option from the sharing menu. SharePoint admin center and OneDrive for Business admin center include the same settings. The settings in either admin center apply to both. Be sure to visit these two areas in Azure Active Directory to complete tenant-wide setup for more secure environments. If your organization includes offices with secure network access, add the trusted IP address ranges to Azure Active Directory as named locations. This feature helps reduce the number of reported false positives for sign-in risk events. Multi-factor authentication requires apps that support modern authentication. Apps that do not support modern authentication cannot be blocked by using conditional access rules. For secure environments, be sure to disable authentication for apps that do not support modern authentication. You can do this in Azure Active Directory with a control that is coming soon. Use PowerShell, see Block apps that do not use modern authentication. Configure this in the SharePoint admin center on the "device access' page — "Control access from apps that don't use modern authentication." Choose Block. Use Office 365 Cloud App Security to evaluate risk, to alert on suspicious activity, and to automatically take action. Requires Office 365 E5 plan. Or, use Microsoft Cloud App Security to obtain deeper visibility even after access is granted, comprehensive controls, and improved protection for all your cloud applications, including Office 365. Because this solution recommends the EMS E5 plan, we recommend you start with Cloud App Security so you can use this with other SaaS applications in your environment. Start with default policies and settings.